They say variety is the spice of life, but it’s also one reason why Viking remains the No. 1 semi-custom builder of sportfishing and motor yachts in the world. Our 55-year-old family-owned-and-operated company offers more than 35 models in 14 different sizes from 38 to 93 feet. 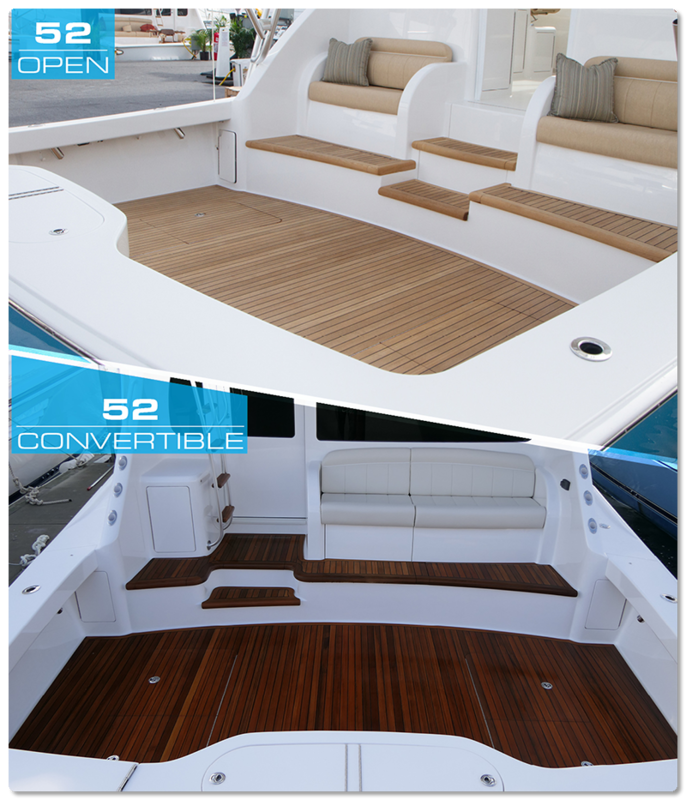 In this Viking View we take a close look at two of our exciting options at 52 feet – the 52 Open and 52 Convertible, which will be on display at the Palm Beach International Boat Show this week. With a helm that’s only a few feet from the cockpit, the 52 Open is ideal for the owner/operator who wants to drive the bus but still be part of the action. Aft of the helm is a salon-like air-conditioned space with a U-shaped lounge, teak table and refrigerator with icemaker. The convertible’s flybridge gives you a high-visibility platform with a tournament-proven walk-around center console helm and plenty of seating for guests. Both models can be equipped with a tower with second helm from Viking‘s Palm Beach Towers and outfitted with a custom electronics package from our subsidiary Atlantic Marine Electronics. 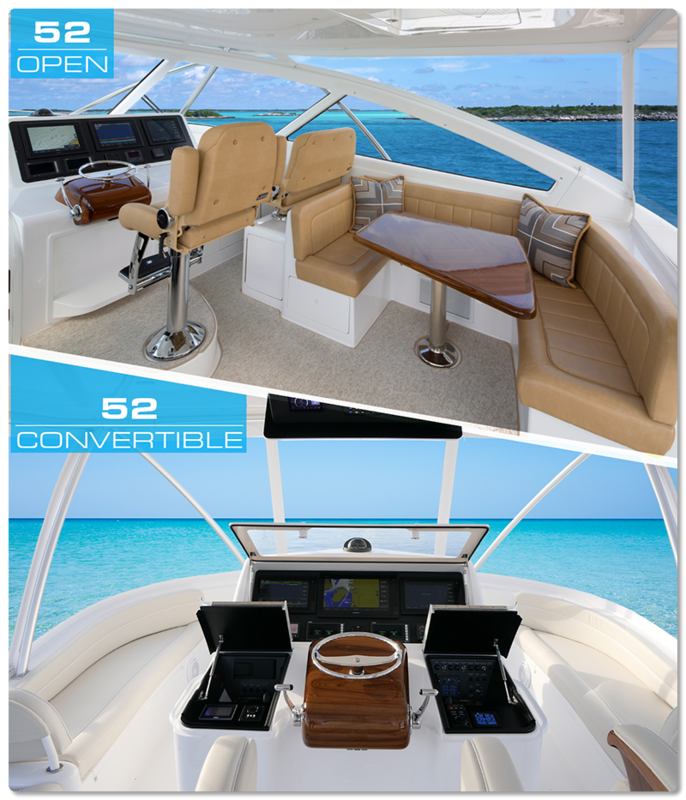 The open and convertible share the same 142-square-foot cockpit design that’s equipped with an arsenal of fishing features (transom live well, in-deck fishboxes, rod holders and laminated mounting plate in deck for fighting chair or rocket launcher installations) to put you in the winner’s circle. Observation mezzanine designs differ, but both provide refrigerated and general storage, seating with custom upholstered cushions and excellent engineroom access via a centerline door and ladder. Hand-finished teak or walnut cabinetry (with hi-gloss or satin finishes), lounges with underneath storage, generous counter space, large-capacity under-counter refrigerators and freezers and custom Amtico flooring are some of the common creature comforts and amenities in the climate-controlled interiors of these two models. 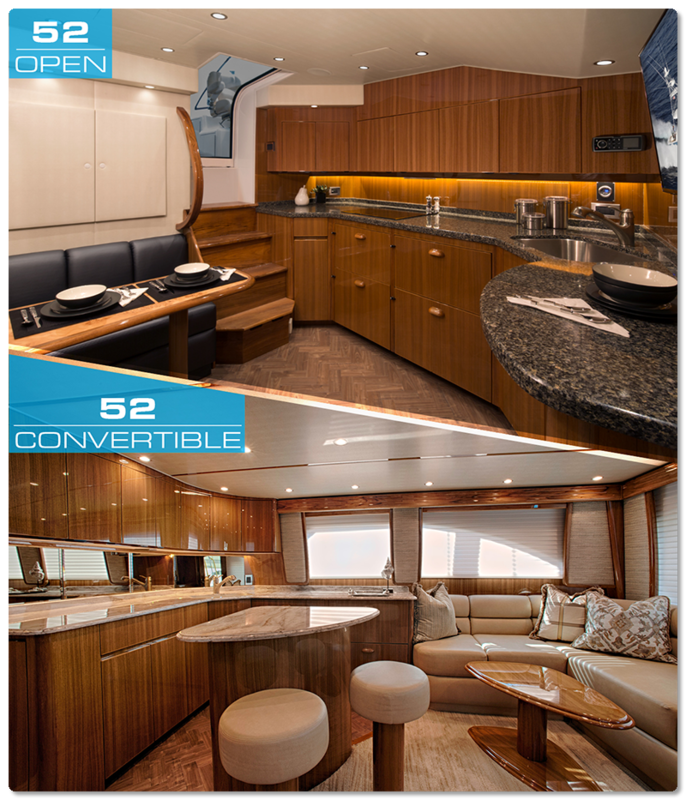 The Open features a dinette with a booth lounge that faces a fully appointed galley. Sociable yet refined, the Convertible‘s free-standing galley island is an inviting social hub. High-performance MAN V12 1400 engines pack the punch for the 52 Open and 52 Convertible. 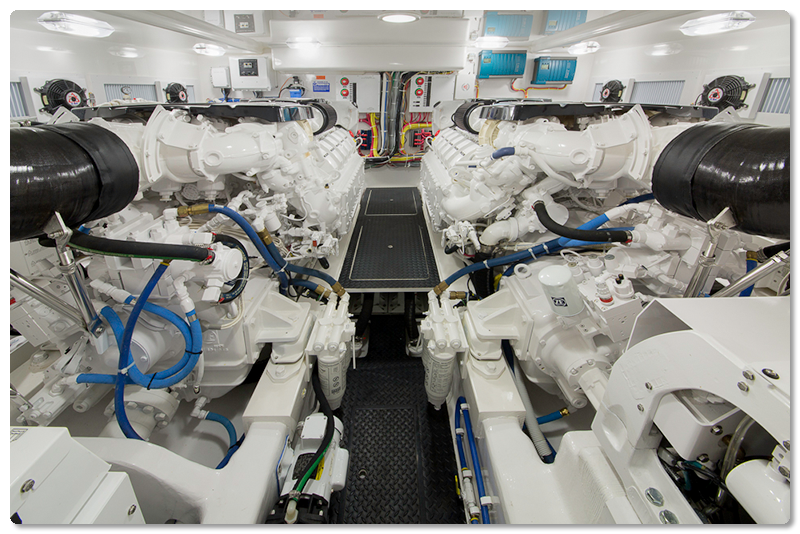 Viking custom designs and engineers each model’s engineroom to maximize accessibility and ease of maintenance. A 21.5 kW generator is standard and there’s ample space for a Seakeeper gyro installation. 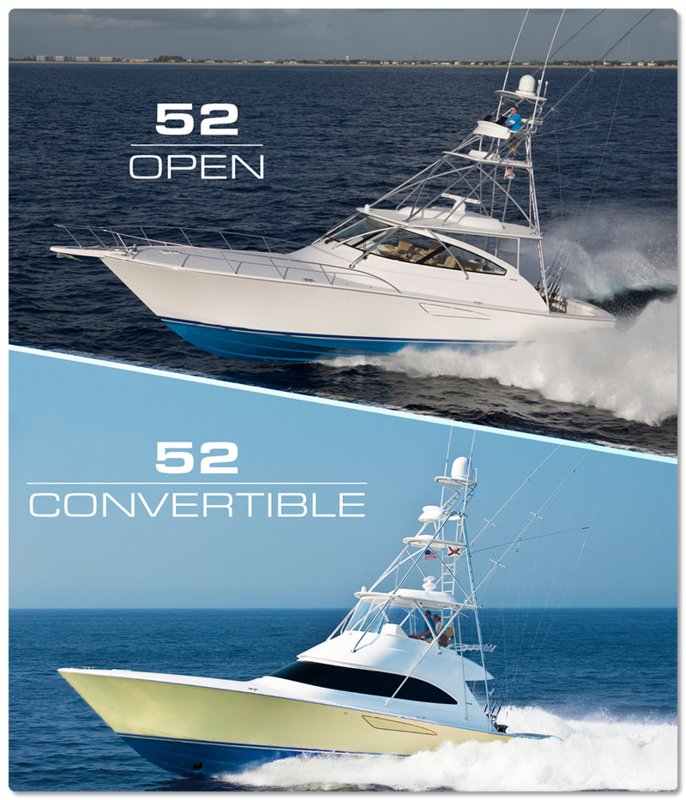 Come and see our two 52s at the Palm Beach International Boat Show, which runs March 28 through March 31. Seven other Vikings will join them as part of the display presented by HMY Yacht Sales, an authorized Viking dealer.